Dramatically display your potted plant using the Esschert Design Round Plant Caddy. Placing your flower on a caddy or trivet elevates it from the ground, for more air circulation around the roots and better water drainage. 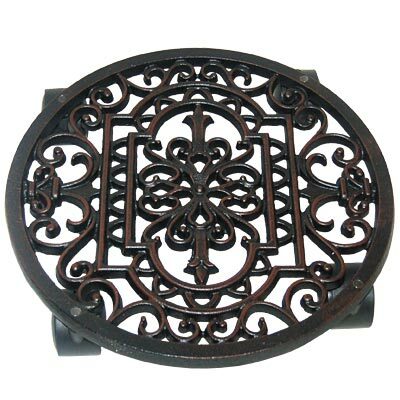 The cast iron body, round shape, and dark brown color lend a traditional look to this unit, and the intricate scrollwork throughout furthers the theme. This caddy can accommodate pots up to 10.5" in diameter at the base, and the four attached plastic casters make repositioning the item simple. Some of these casters can also lock into place, to keep the caddy in one spot on your deck. Elevate a potted plant easily using this Round Plant Caddy.